1/22 - FB @ 30.65 Half pos. Now I have 1.5position on and want more. 1/22 - TAN @18.40. Half pos. Solars are very strong, looking for br-out from bull flag. Will add, not going to hold too long - next swing high is target. Cocoa is back in a box. I consider breakout failed. Daily chart looks like bear-flag. No re-entry for 4 days. So Volatility via VIX is below 13, which is lowest reading in over 3 years. That among other factors, prompting people to think that the Top is at hand. Fools. 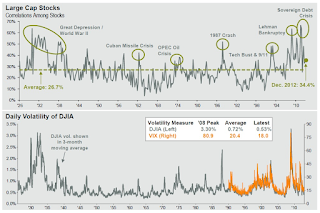 Vol can stay low for months and years, infact it did so in 2004 (or there-about), creating a treacherous short squeeze, low-volatility advance - an essence of long-term bull market. Low VIX is not an actionable trading signal. 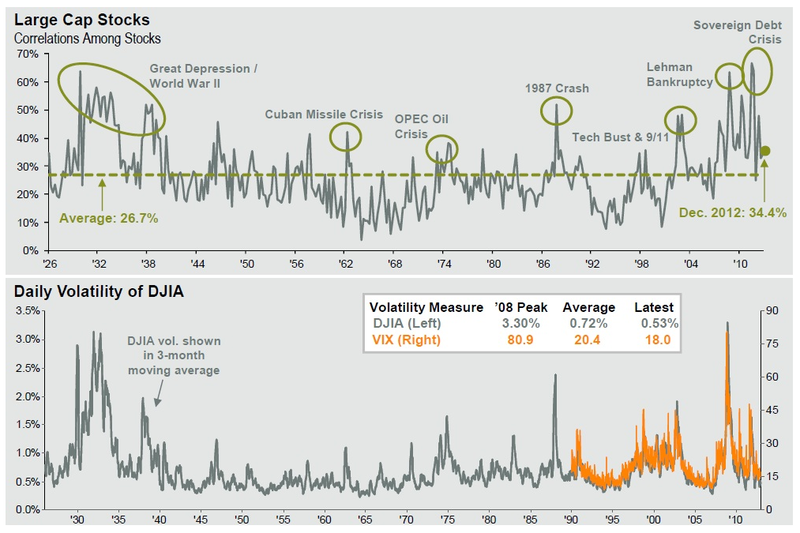 Based on this chart, VIX is at historically "normal" level. I don't want to have a forecast. Neither short, nor long term. I can make a bunch of valid arguments for and against long-term bull market. Having said that, I feel mighty giddy. I should. I already made more money in this January than in all of 2012. So this is for sure a time to be careful, bring the stops closer, see if I can rotate from over-extended areas into something that about to get going. Except, I don't see anything interesting right now. So what do I do on Wall Street when Volatility Dead? Main 1. This one makes sense. Not sure of GCC. Need commodities futures index, but not sure of equal weight or like CRB ? Biggest on Wall-street. Sum of market caps is little over 3 Trillion ! "Mighty Dozen"? Giant Dozen? Surprisingly, not only they (as a group) do not outperformed SPX , they are not very much correlated to SPX either. All, except Buffett and PTR are part of S and P 500. Note: I included PetroChina, because it's #3 in the world now, otherwise I decided to stick with good 'ol USofA. Used market cap data for BRK/A, included B-shares for ease of use. I am going to make a chart in Excell. Average closing prices, throw in a couple MA's and see what happens. Technology. Not sure of this selection, I made this list awhile ago. Why is EWX here? Positions, Watch List. 50% invested.